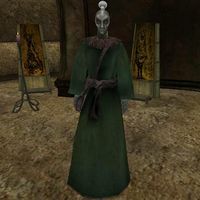 Tivam Sadri is a Dunmer priest who sells ingredients and potions at the Holamayan Monastery. He is a restocking vendor of the following ingredients: Ash Salts, Corkbulb Root, Ectoplasm, Ghoul Heart, Gravedust, Hackle-Lo Leaf, Muck, Saltrice and Scrib Jerky. This page was last modified on 8 December 2013, at 05:39.